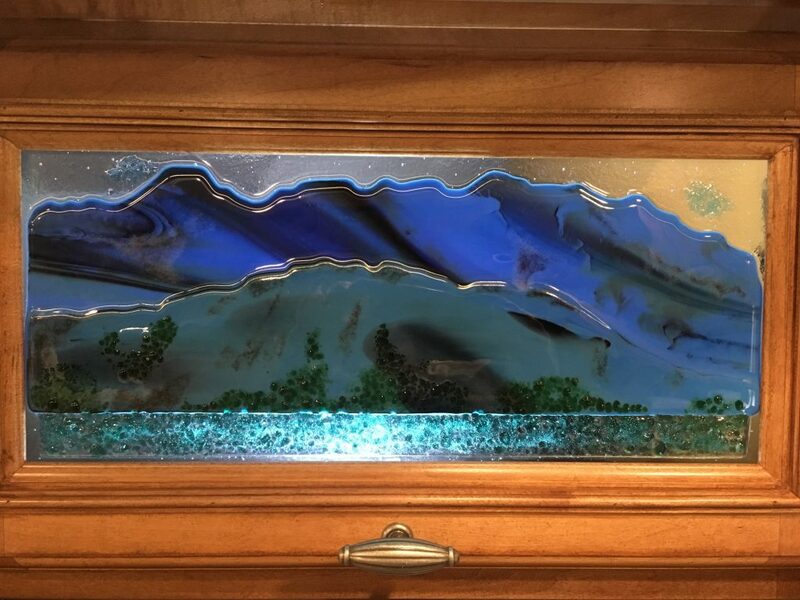 I love Fusion Glass and how you can make it your own!!! You can purchase most of my pieces that are on the Web Site as is, or you can also commission my work to make it your own style – whether its with colour or a little bit of a different design – its unlimited – you just have to see your vision and then let me see it too!!! 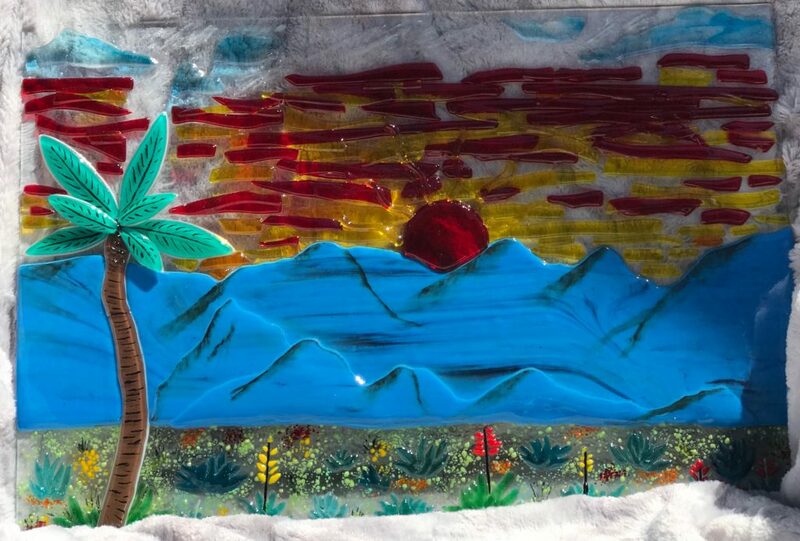 This Fustion Glass Artwork was made for a Customer who wanted to have a Palm Tree, Mountains, and a Sunset and a lot of colour. I actually took the Sunset from a picture I took in Arizona as the Sunsets here are amazing here. This Piece was a Custom Order!!! All you have to do is let me know your vision and I’ll take it from there. 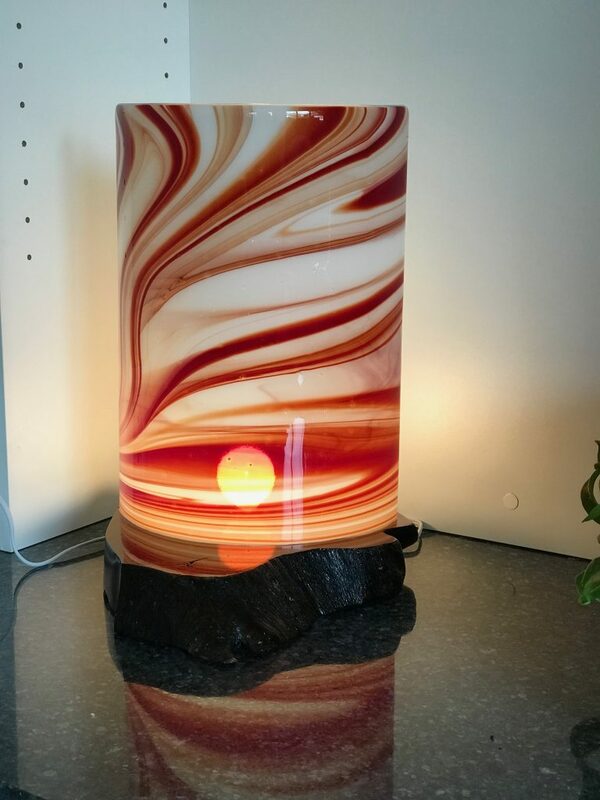 I made this Lamp out of Fusion Reserve Glass and my husband made the base out of wood. 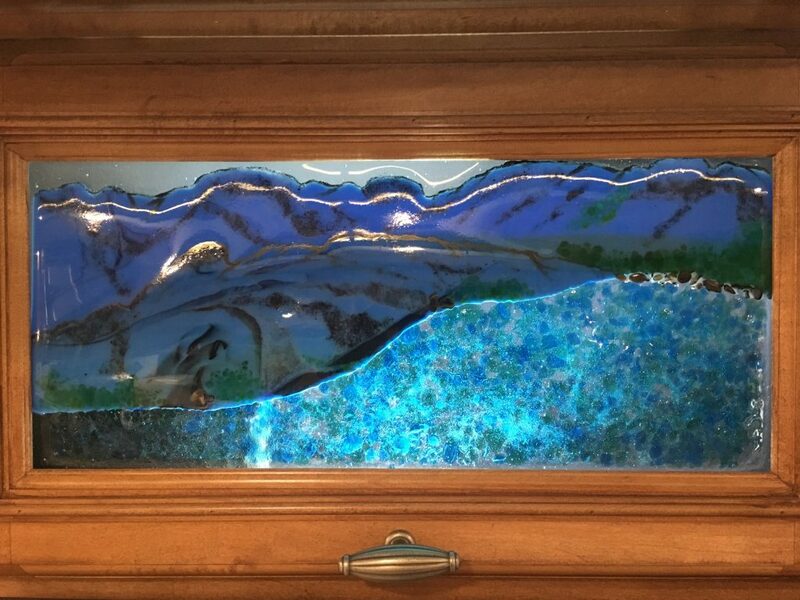 Both my husband and I love this piece and because we love it so much it is not for sale. 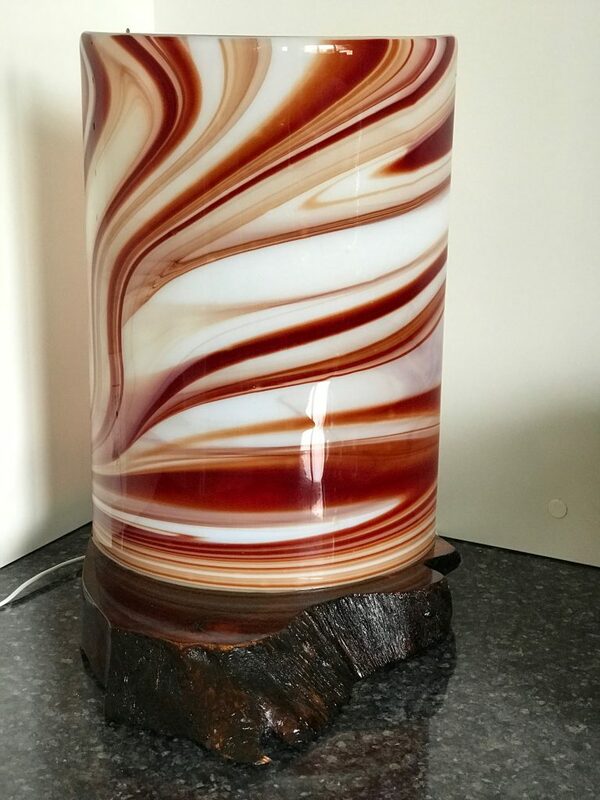 You can have the Lamp with Wood Custom made to suit your colours. The Piece below my husband asked me to do – I have to say it took me awhile to start this project as I really wasn’t sure where to start. 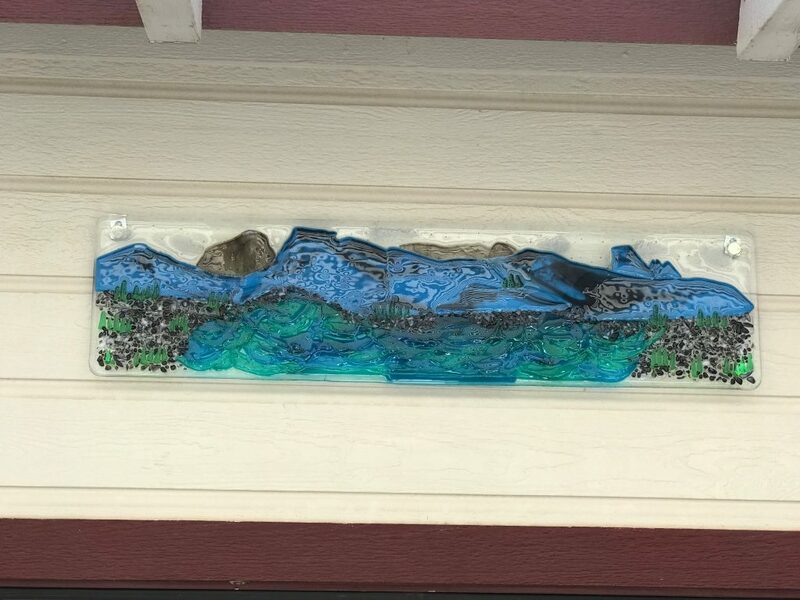 I went to buy some Glass and saw the blue piece (see picture) and knew that this was going to be my Mountain, once I started working on the Mountain part everything else just fell into place. I have to say I’m very pleased with the end result. 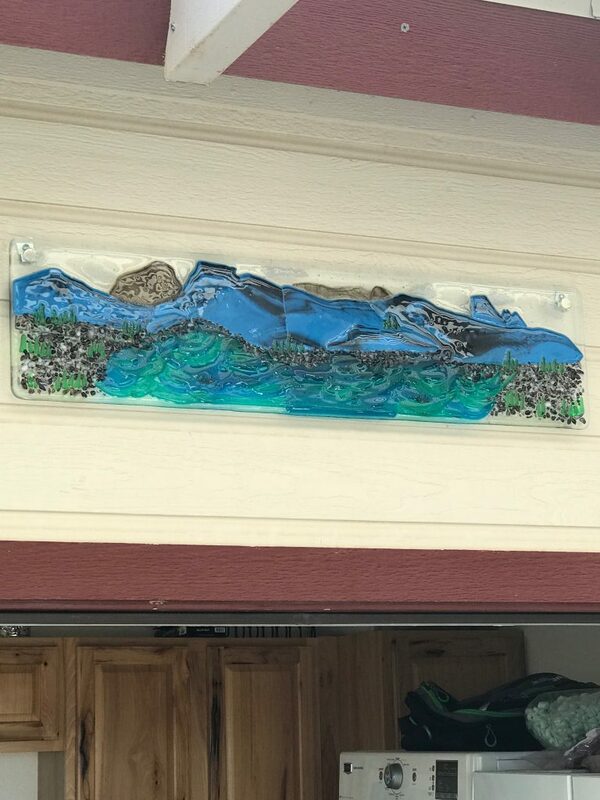 If you would like a Mountain Scene please let me know what you would like and I can a custom order it for you. 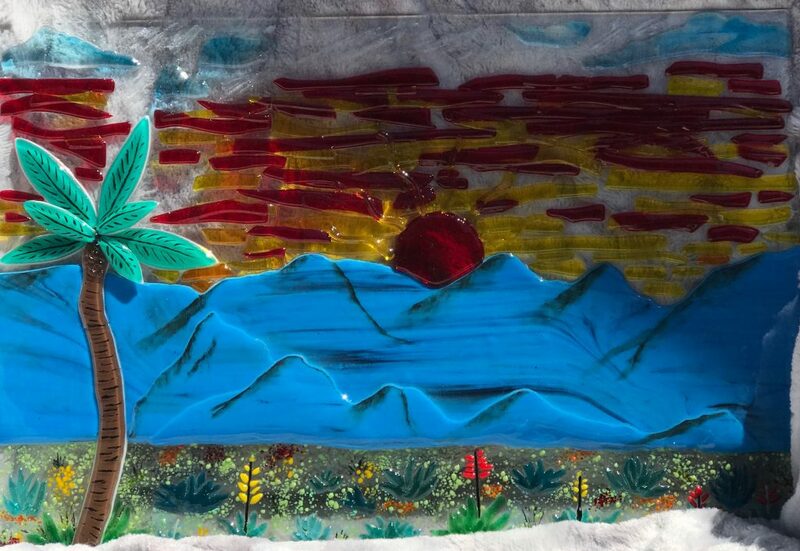 I love doing Mountain Scene’s!!! 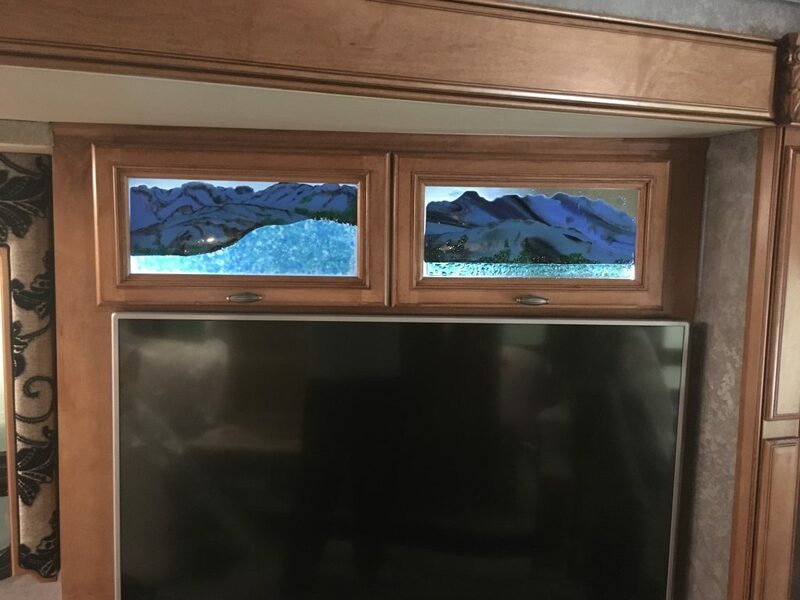 These cabinet inserts were made for a Motorhome, the owner of this Motorhome had smoked glass in the cabinet and asked me to do a Fused Glass Mountain Scene to bring some colour into the room. 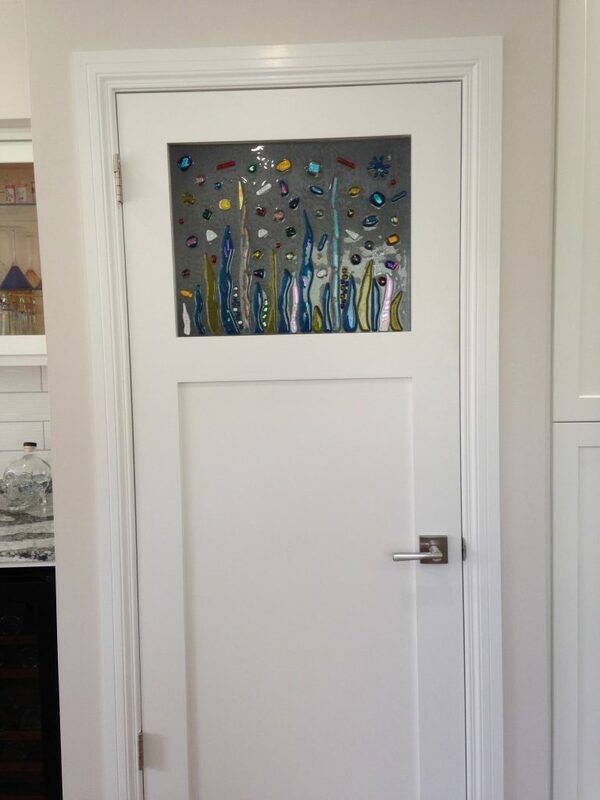 If you would like to have Fused Glass Cabinet Inserts added to a room please get in touch with me. 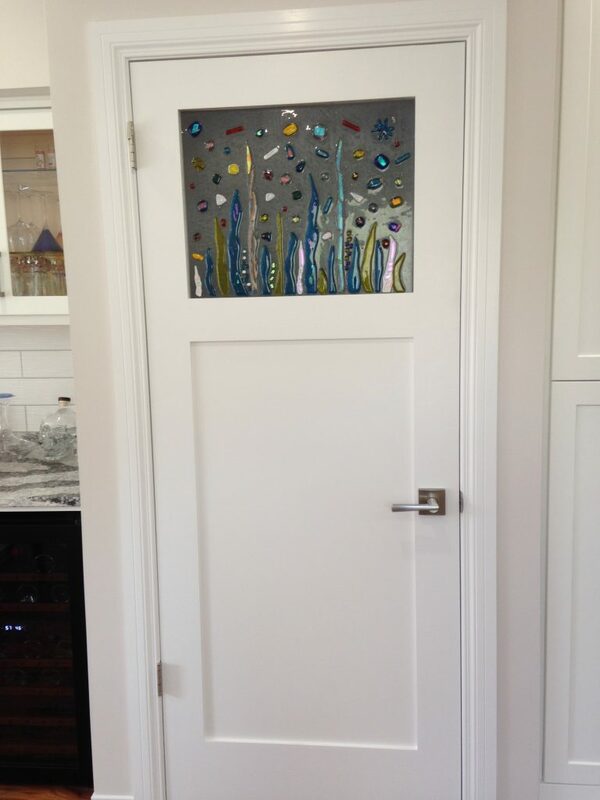 The Door Insert that you see below I made specifically for our Kitchen Door going down to our basement – I knew I wanted transparent colours that could be lit up but that you could not see through and this is what I came up with. I talked to our friend (who renovated our house) and we figured out the size and went from there. 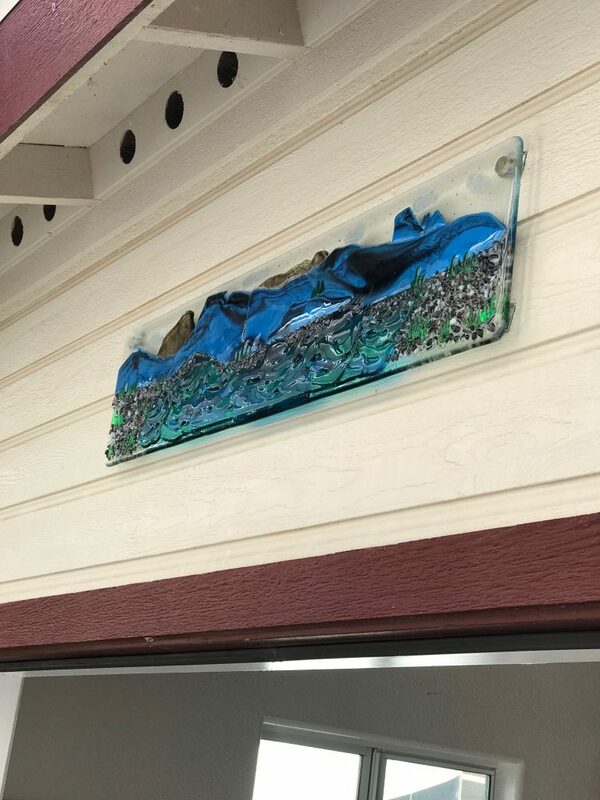 This door insert was one of my first big pieces I had ever done and thankfully I had help from the wonderful people at the RV Resort we reside at during the winter months. 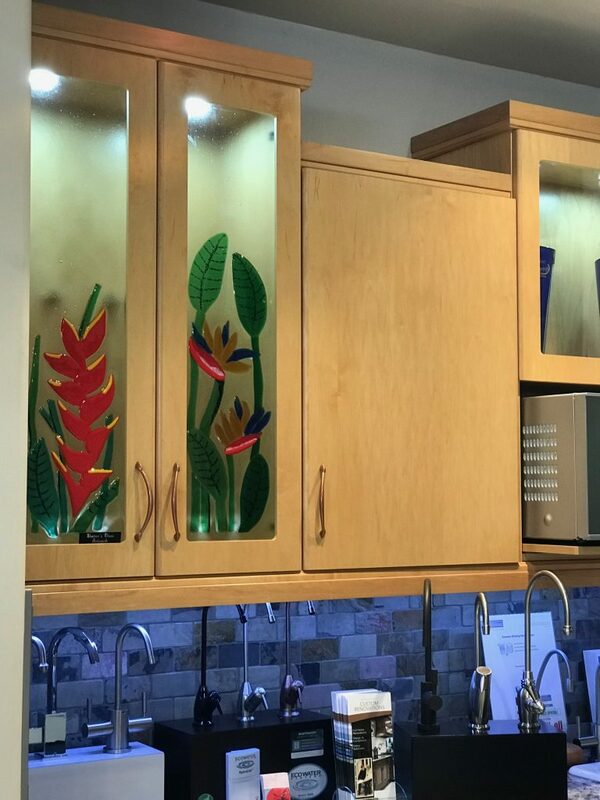 A good friend of mine owns Independent Bath Products and Independent Custom Renovations in Edmonton and has let me display my Glass Cabinet Inserts. 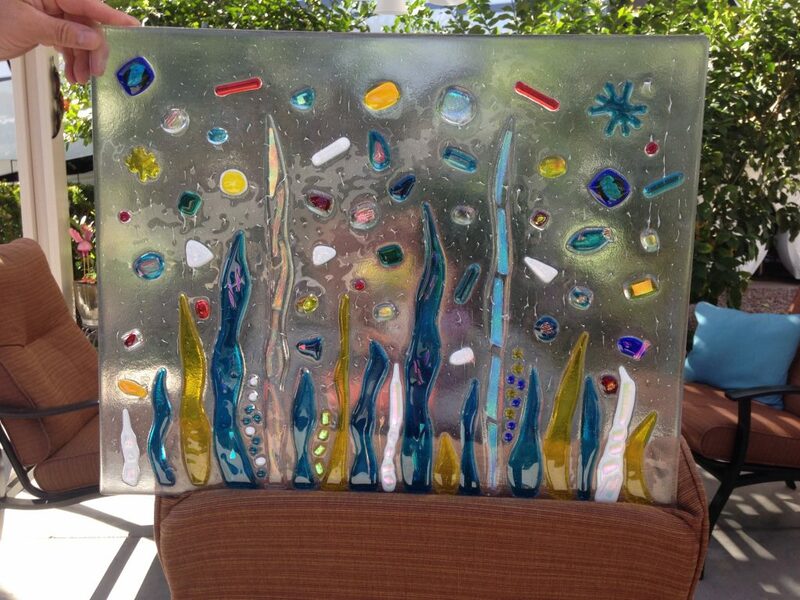 The Inserts are actually one of my favourite Fused Glass Pieces as you can really show/display your own Custom Piece. 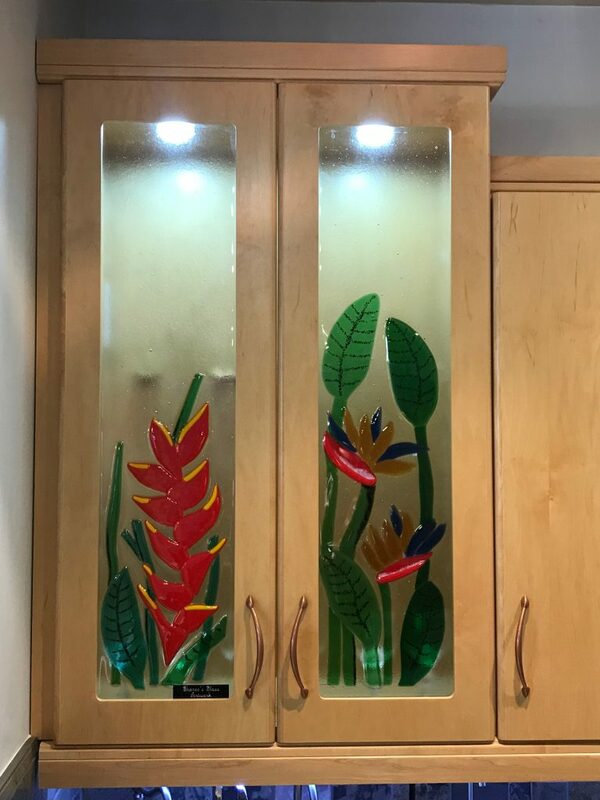 For my display I decided to do the Bird of Paradise and the Heliconia Tropical Flower. All I need is the size of your Glass and your idea’s of what you would like to see.